"This attractive layered dip for tortilla chips is filled with fresh ingredients. The addition of cocktail sauce is a nice, spicy twist." In a blender or food processor, thoroughly mix cream cheese, sour cream and mayonnaise. Spread the mixture evenly in the bottom of a medium serving dish. 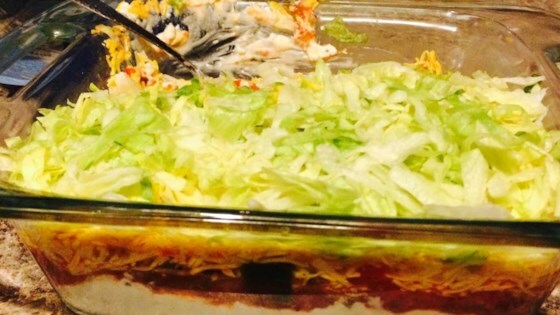 In individual layers, top the mixture with cocktail sauce, mild salsa, diced green onion, red bell pepper, green bell pepper, shredded Cheddar cheese and shredded lettuce. Arrange cucumber slices around the edge of the serving dish. Chill in the refrigerator at least 2 hours before serving. Find out how to make creamy, delicious homemade spinach dip. I've made this several times. It's always gobbled up! Do NOT leave off the cucumbers, they give it a wonderful flavor! This is one of the dips I make that EVERYBODY loves! There are too many veggies in this to make it a good dip. I made this for my 6-yr. old nieces' b-day party and I received a dozen requests for the recipe. I used light cream cheese and light mayo. no one new and there was no left. This was easy. It was good. It is a good party dip because you make it ahead of time. I would make it again. I did not include the cucumbers I don't know they seemed out of place.